I would like to begin by thanking the Oxford Union for inviting me to speak in this hallowed hall across from this beautiful portrait of my mother, Shaheed Mohtarma Benazir Bhutto. During my Undergraduate years I used to attend quite a few of the socials here and it’s an honor to have finally made it up to this side of the podium. My mother spent some of her happiest times here at Oxford and it is very gracious of you to keep her memory alive at this renowned institution through events such as this one. I would like to thank my fellow speakers, George Galloway and Aunty Victoria, for making time in their busy schedules. And I would like to thank my friends and family for joining me here today. I also would like to thank Saria Benazir for her lovely tribute to my mother. “We all have one purpose — to give back people their rights,” the patron-in-chief says. 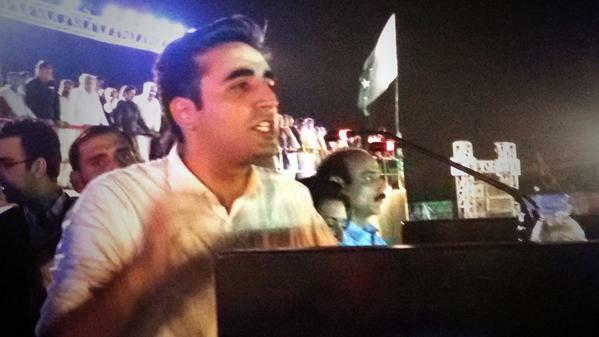 “Democracy is our strength, the nation is our center of power and martyrdom is our destination,” Bilawal says. In a jab at former dictator Pervez Musharraf, Bilawal questions Musharraf’s statement of Benazir’s rally ending before midnight. “How did Musharraf know that the rally will end before midnight?” he asks in a veiled accusation of Musharraf being responsible for the attack. 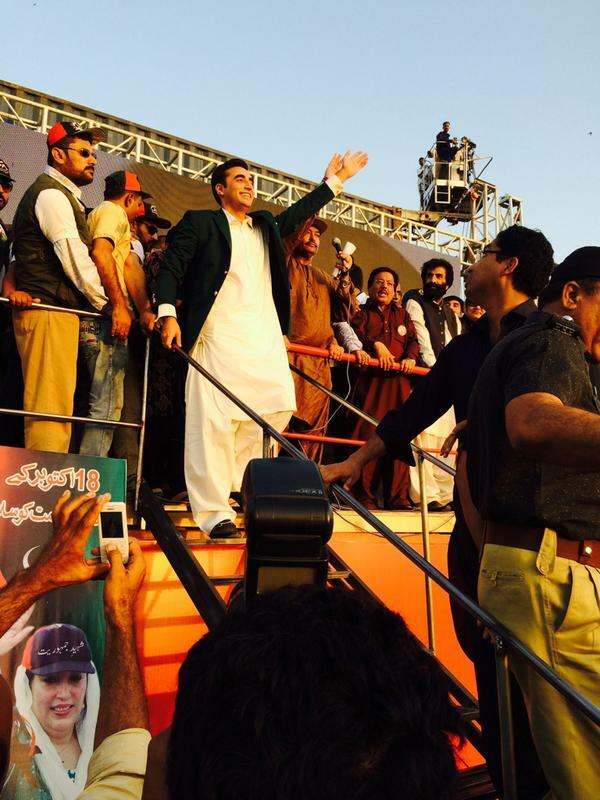 Bilawal repeats the famous lines: “Armed men are scared of innocent girls,” while talking about the Karsaz blast. “Suicide blasts and death penalties are only for us,” he says. “Why are suicide attacks only for us [PPP]?,” he questions rhetorically, adding that people who want to scare away PPP with these things should understand that a Bhutto does not fear anything. He asks people to remember that if there is no PPP, there will be no ray of hope in Pakistan. “Because of the 1973 charter, there is democracy in Pakistan,” he says, adding that the enemies of Bhutto and sons of Ziaul Haq take the oath of that very Constitution established by his grandfather. “Today, there are rumors of a script because the government is helpless and people are protesting. I will tell you what the real script is,” he tells his supporters. “Bhuttoism is the only solution to avoid a civil war in the country,” he says, further criticising incumbent Prime Minister Nawaz Sharif and questions how he could utilise all resources in curbing one sit-in. “We [PPP] saw a Hazara community’s dharna — the only real dharna in Pakistan — but on moral grounds we dissolved our own government,” he says, questioning what the Punjab chief minister did in Model Town. Bilawal lashes out at Punjab Chief Minister Shahbaz Sharif and calls him a progeny of Zia, as he was responsible for the deaths of 14 people who were killed during the clashes in Model Town incident in Lahore. “We had seen the protests in Quetta by the Hazara community which was against extremism. Our prime minister himself visited Quetta, and though it is possible that our governance was lacking, the prime minister was not responsible,” he says. “We, to assuage the wounds of the hurt, ended our provincial government, but what did you do in Punjab?” he says, hitting out at Nawaz and Shahbaz. “The foreign minister, and other puppets, you are all responsible for the Chinese president cancelling his tour to Pakistan,” he says. Bilawal speaks about the developments brought by PPP. 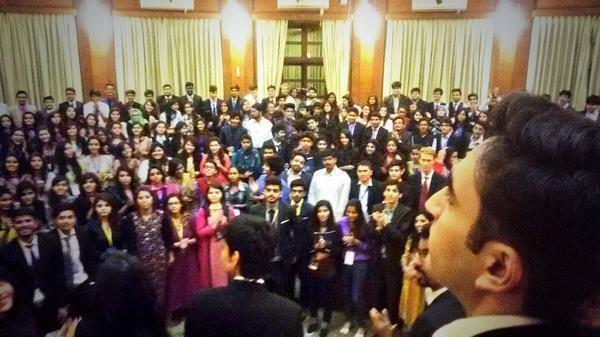 “People do not see the work we have done in Sindh, because some powers do not want people to see it,” says Bilawal. He further adds that the PPP did not make a song and dance of terming an ordinary bus by calling it a metro bus. “PTI wants to become the MQM of Lahore,” says the PPP chairperson. “Karachi belongs to Bhutto,” he says claiming that they will cut down the kite — the symbol of the MQM. The patron-in-chief adds that wind power generated in sindh can provide electricity to the whole country. “Family members of the missing people marched from Balochistan to Islamabad, but no one asked about them. They did not hold a concert at Aabpara Chowk, they did not demand the resignation of anyone, they did not dance on the instructions of any one but a few puppets stage a sit-in and the media raise the issue to the sky,” Bilawal says criticising the media and protesting parties. “If you did not have that freedom, you too would have been killed with F-16s like Akbar Bugti. “When I talk about Kashmir, they misunderstand me. I too want peace in Kashmir. We will not hold Kashmir hostage to the peace process but we want the people of Kashmir to decide. Kashmir banega Pakistan,” the PPP chairman says. Bilawal explains that former president General (retd) Pervez Musharraf’s operations against militants failed because the people were not behind him. “Operation Zarb-e-Azb is continuing and we will win,” he adds. “Some people are stabbing the army in the back,” he alleges. Hitting out at PM Nawaz, Bilawal says that the problem with the Nawaz-led government is that Zia’s spirit has infused their governance and urges them to adopt Bhuttoism. “We will hold a convention of PPP in Bilawal House Lahore on November 30. We will hear what each and everyone of you have to say about the reorganisation of PPP. 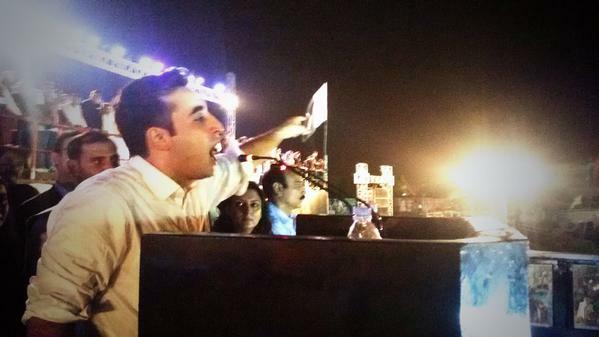 You will talk and we will listen,” Bilawal says. “To hunt a lion, you use an arrow, not a bat,” the PPP chairman says patronising PTI’s protests in the capital. You don’t have to like me, but, if u don’t agree with what I say you’re on the wrong side of history. 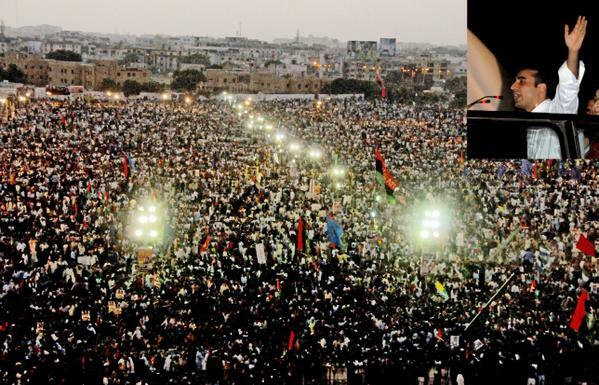 Bilawal Bhutto Zardari’s speech on the 35th Barsi of Shaheed Zulfiqar Ali Bhutto! Bilawal Bhutto Zardari Complete Speech ….